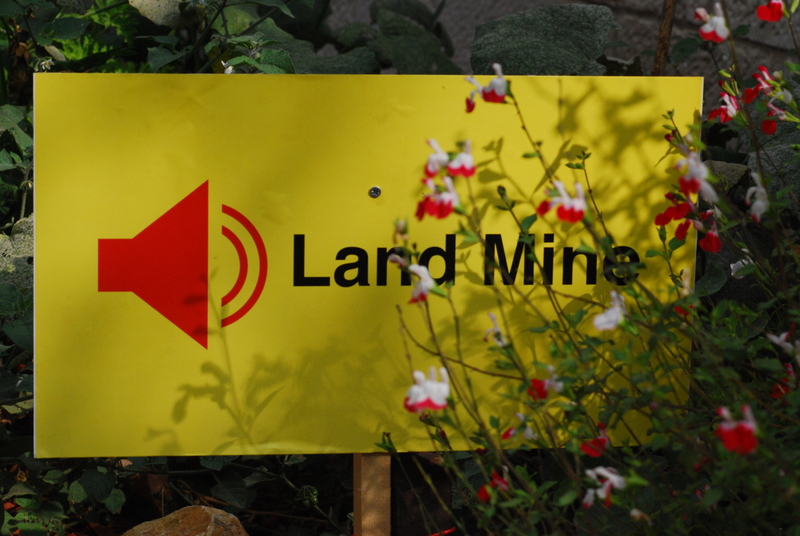 In the Autumn of 2011 as part of my Seven Walks in a Holy City project, in the neighbourhood of Musrara, I came across an artwork by Gavri Guy, called ‘Landmine’. I took a photo and was told that it is an interactive artwork. Buried around the sign in the ground are sensors that when stepped on, will trigger an online search for the word Land. I find the work striking for many reasons. It offers a powerful reminder (if one is needed) that the conflict started over land and the opposing sides claims over it. The title playfully recalls children squabbling over a toy or a sweets (the familiar ‘Mine! no its mine! ), simultaneously reminding us of the potentially bloody consequences. More importantly, as a site specific work it is a reminder that temporality is an equally powerful player in the conflict. As there are fewer and fewer people who walk these streets and still remember the area as one, which in the years preceding 1948 had been shared, the less likely it is that it will be shared again, in an egalitarian way. In stark contrast to the evocation of children squabbling over a coveted object- be it land or a toy- I watch with horror the childish smirking faces of the Israeli soldiers as they bombard civilian protesters marching in protest against the wall in Billin, with tear gas that can maim and kill (and has done on many occasions before). I cannot help but think that despite being allowed to use deadly ‘toys’ (for they do treat their launchers as toys) they cannot be allowed to see the ‘bigger picture’- their vision blinkered by nationalist and colonialist rhetoric that in most cases they do not know of, let alone question.